Firstly a happy New Year to all our readers. I hope that the unique weather of recent weeks has not caused you many problems. 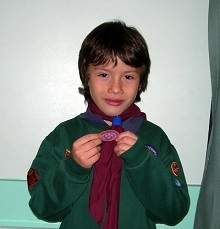 2009 ends with more Top Awards. 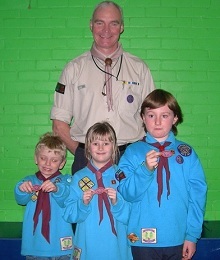 Cody Longley, Clementyne Barrett and Jude Ramsbottom all of Redwood Beavers were presented with their Chief Scout's Bronze Awards by Ian Stott, the District Commissioner for Havant. 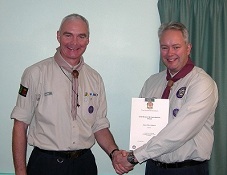 A few days later, Ian was back on Hayling to present a Chief Scout's Gold Award to Adam Saunders of Lion Scout Troop. 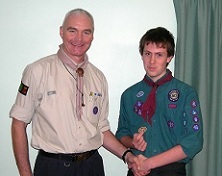 Nathan Aguillar-Dunne also received his Chief Scout's Bronze Award, which was presented by Ian Hawke, on behalf of Ian Stott. 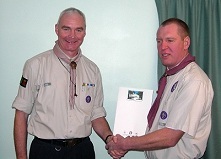 Congratulations to James Perfett on completing the Leader Training and being awarded the Wood Badge by Ian Stott. The Leader training programme consists of 19 modules covering a range of skills to help the Leaders deliver exciting, adventurous and safe Scouting. The modules include First Aid, Child Protection, administration, camping, outdoor skills, dealing with challenging behaviour along with other leadership and teamwork skills. Well done James. Congratulations to Brian Bocking, Minnie Deans and Jean Yates who each won £25 in our November draw and to Chris Thomas, Sandra Reed and Sandra Haines who won £25 and Sarah Dawkins who won the quarterly £50 prize in the December draw. Our latest book sale at the end of November made a profit of nearly £700. During the year of 2009, Phil Blosse and the bookies raised over £1700 for the Group. Many thanks to all of you who helped with the delivery of this year's post. Over 5000 cards were delivered and a profit of nearly £1000 raised towards our funds. 40 Beavers, Cubs and Leaders joined others at St Mary's Church for their Christingle Service, which ended with the traditional lighting of Christingle candles. The last Explorer meeting before Christmas, was attended by Ian Stott the District Commissioner for Havant who presented awards to members of the Unit. Rosemary Harrison and Alistair Harris were presented with their Chief Scout's Platinum Awards and their Duke of Edinburgh Bronze Awards, whilst Kathryn Lincoln, Zack Allgood and Liam Holden received their Chief Scout's Diamond Awards and the Duke of Edinburgh Silver Awards. Well done to you all. The Beavers of Aspen Colony performed their own version of the nativity for their parents and families. You can see from the picture just how much they enjoyed their performance. Our newly formed Dreadnought unit decided to hold a frost camp as their first event of 2010. Despite the snow still lying on the ground and a forecast of more to come, they still spent a night in camp, although they did change plans by camping on Hayling rather than in Dorset. This years post sort was a bit different to previous years. The sorting was the same, but this year the evening included a four course banquet cooked by members of Dreadnought. A first course of lamb and vegetable broth was followed by Roast Chicken and a selection of vegetables. The final course consisted of fruit and Ice Cream. It will soon be time to register for our 100 club for the next 12 months. The first draw will be in April 2010. The cost of membership is again £24 and there are 41 chances to win a prize. Lorna will be contacting all of this years members and all families will receive an application form. As we start a new term and for those of you not paying by Standing Order, subs of £24 are due. During this term you will receive a letter and a form as we are hoping to introduce Standing Order as the normal method of paying Subs. This will help our Leaders and also the treasurer. Next time you get the chance take a look at the new section called "Adults in Scouting" from the top menu. You will find details of the different ways in which those aged 18 or over can take part in activities, learn new skills, or support the leaders or our Group.